1.3. The Sites are designed to provide a forum, enjoyable for all, for the exchange of opinions, comments and information and, therefore, Ethio Beauty Magazine requires its users to abide by these Terms. Your use of the Site will constitute your agreement to comply with these Terms. 1.5. Ethio Beauty Magazine may modify these Terms from time to time. Continued use of the Sites by you will constitute your acceptance of any changes or revisions to the Terms, so it is wise to check this page regularly. 1.7. From time to time, our Sites may publish articles or features, which some site visitors may find offensive. Ethio Beauty Magazine does not intend to offend and suggests that Site visitors who find the tone or content of the Sites offensive, no longer visit the Sites. No responsibility is taken for any offense caused. 2.1. Ethio Beauty Magazine or its licensors own all material on the Sites. You may retrieve and display content from this Sites on a computer screen, print individual pages on paper (but not photocopy them) and store such pages in electronic form on disk (but not on any server or other storage device connected to a network) for your own personal, non-commercial use. You may not in any way make commercial or other unauthorised use, by publication, re-transmission, distribution, performance, caching or otherwise, of material obtained through the Sites. 2.2. You acknowledge that all magazine brands are trade marks and that you may not use them without prior written permission from Ethio Beauty Magazine. 2.3. You may not authorise others to use the Sites, and you are responsible for all of your own use of the Sites. You agree not to use any obscene, indecent or offensive language, or to place on the Sites any material that is false, defamatory, abusive, harassing or hateful. Further, you may not place on the Sites any material that is encrypted, constitutes junk mail or unauthorised advertising, invades anyone's privacy, encourages conduct that would constitute a criminal offence or give rise to civil liability, or that otherwise violates any local, state, national or international law or regulation. You agree to use the Sites only for lawful purposes and you acknowledge that your failure to do so may subject you to civil and criminal liability. 2.5. Other than connecting to Ethio Beauty's servers by HTTP requests using a web browser, you may not attempt to gain access to Ethio Beauty's servers by any means, including, without limitation, by using administrator passwords or by masquerading as an administrator while using the Sites or otherwise. 2.7. You agree not to disrupt, modify or interfere with the Sites or its associated software, hardware and servers in any way, and you agree not to impede or interfere with others' use of the Sites. You further agree not to alter or tamper with any information or materials on, or associated with, the Sites. 2.8. You acknowledge that Ethio Beauty Magazine has not reviewed and does not endorse the content of all sites linked to from the Sites and is not responsible for the content or actions of any other sites linked to from the Sites. Linking to any other service or site from this Site is at your sole risk. By using the Sites or posting content on any Discussion Forums you confirm that you are 18 years old or more or, if you are under 18 years old, that you have received your parent's or guardian's consent to enter into these Terms. 4.3. We cannot and do not review every post before it appears on the Sites. Ethio Beauty Magazine operates a 'notice and take-down' policy which means if Ethio Beauty Magazine notices or is made aware of a post that contravenes these Terms, Ethio Beauty Magazine reserves the right to amend or remove the post. 4.4. Ethio Beauty Magazine encourages you to contact us if you feel a post violates these Terms. Please use the report function on the Site to let us know. 4.5. You are responsible for the content of your posts and Ethio Beauty Magazine does not accept any liability for the content or accuracy of your messages. 4.6. Users of the Site may submit material for publication in the Discussion Forums. Ethio Beauty Magazine accepts no liability in respect of any material submitted by users and published by Ethio Beauty Magazine and Ethio Beauty Magazine is not responsible for its content or accuracy. 4.9. You acknowledge that any breach of these warranties may cause Ethio Beauty Magazine damage or loss and agree to indemnify and hold harmless Ethio Beauty Magazine in full and permanently against any third party liabilities, claims, costs, loss or damage incurred by Ethio Beauty Magazine as a result of publishing any material you submit to us, including consequential loss. 4.10. Should Ethio Beauty Magazine become aware of any activity that would be contrary to the Terms or determine in their sole discretion to be unacceptable, then Ethio Beauty Magazine reserves the right to take action including temporary or permanent removal of content, filtering of internet transmissions and/or to exclude the user with immediate effect and, where necessary, to forward any incriminating material in its possession to the UK police or other relevant authorities. 4.11. You accept that Ethio Beauty Magazine may keep a record of your IP and/or host address for reference purposes only (in order to keep a track on the amount of visitors per day). In the event of any breach of these Terms, Ethio Beauty Magazine may view and add your IP and/or host address to an 'excluded database' to prevent you gaining further access to the Sites. These addresses are not distributed or given out to any third party services. Postings to the Discussion Forums are not private. You grant Ethio Beauty Magazine a perpetual royalty free non-exclusive licence to use, reproduce, modify, translate, transmit, distribute and sub-licence any information or material you supply or communicate to the Sites via such postings, in any medium now in existence or hereafter developed, for any purpose, including commercial uses to any third party. Ethio Beauty Magazine will not return it if submitted, and accepts no liability whatsoever for safe custody thereof. 6.1. All copyright, trademarks, design rights and all other intellectual property rights (registered or unregistered) where relevant in and on the Site and all content located on the Site shall at all times remain vested in Ethio Beauty Magazine. 6.2. Ethio Beauty Magazine grants you a limited, non-exclusive, revocable, non-transferable licence to use the Site content solely for personal use relating to your use of the Site. Except as expressly set out herein, neither you nor anyone acting on your behalf acquires any intellectual property rights relating to any Site content. Any rights not expressly granted within these Terms are reserved. 6.3. By sharing any contribution(s) with us (including but not limited to data, text, photo, message, posting, image, logo, attachment, hyperlink and all other content (collectively "Contribution(s)") to the Site, you agree and grant Ethio Beauty Magazine and its sub-licensees, free of charge permission, to use the Contribution(s) at Ethio Beauty Magazine sole discretion (including modifying and adapting it for operational and editorial reasons) in connection with the operation of the Site and our business. The licence extends to copying, distributing, broadcasting or otherwise transmitting, adapting or editing the Contribution(s). 6.4. You agree and confirm that any Contribution(s) you provide or upload is original to you and does not infringe UK laws, copyright or other rights of any other person, or that you have the consents necessary to provide the Contribution(s) to Ethio Beauty Magazine. 6.5. You acknowledge that Ethio Beauty Magazine does not endorse the accuracy, integrity, copyright, compliance, legality, quality or decency of any Contribution(s). Users may respond to or comment upon Contribution(s), such comments do not necessarily represent the views or opinions of Ethio Beauty Magazine. 6.6. 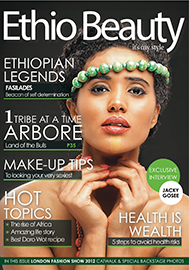 Ethio Beauty Magazine respects the intellectual property of others, and we ask our users to do the same. Ethio Beauty Magazine may, in appropriate circumstances and at its discretion, terminate the access of users, subscribers, and account holders who infringe the copyright rights of Ethio Beauty Magazine and of others. 6.7. If you believe that your work has been copied and is accessible on any Ethio Beauty Magazine Site in a way that constitutes copyright infringement, or that the Site contains links or other references to another online location that contains material or activity that infringes your copyright, please contact Ethio Beauty Magazine immediately using the report function on the Site. All magazine trade marks are trademarks of Ethio Beauty Magazine or its sister companies and may be registered in certain jurisdictions. All other trademarks used on these Sites are the property of their respective owners. 8.1. From time to time Ethio Beauty Magazine will run competitions, free prize draws and promotions (“Competition(s)”) on this website. Competitions may be subject to additional terms that will be made available at the time. 8.4. It is assumed that by entering Competitions which, if won, could result in time off work, your employer has agreed to allow you time off. When dates are specified they cannot be altered and by entering date-related Competitions Ethio Beauty Magazine or the third party are not liable in any way to any winner who cannot attend. 8.5. Competitions are not open to any employees of Ethio Beauty Magazine, the promoter or their immediate families, a Competition promoter’s advertising agency and sales promotion consultancy, or anyone else connected with the creation and administration of the Competition. 8.12. Ethio Beauty Magazine’s decision is final in every situation, including any not covered above and no correspondence will be entered into in respect of the validity of any such decision. 8.13. Ethio Beauty Magazine shall be permitted to exclude or disqualify any entrant at any time at its sole discretion. 8.14. Ethio Beauty Magazine reserves the right to exclude late, incomplete or multiple registrations, or registrations made by third parties or agents. 8.15. Ethio Beauty Magazine does not accept any responsibility for late or lost entries. Proof of sending is not proof of receipt. 8.16. The name of the winner(s) will be available by sending a stamped addressed envelope to Ethio Beauty Magazine Head office, indicating the name of the Competition. 8.18 Prizes must be taken as stated and cannot be deferred although Ethio Beauty Magazine reserve the right to change the prize in the event of unforeseen circumstances. There will be no cash alternative. 8.19 Ethio Beauty Magazine reserves the right to (i) cancel and/or withdraw this Competition and/or (ii) amend these Terms, at any time without notice. 8.20 To the fullest extent permitted by applicable law, in no event will Ethio Beauty Magazine be liable, whether in contract, tort (including negligence), breach of statutory duty, or otherwise, for any loss, damage or injury arising under or in connection with this Competition. 8.21 Where Ethio Beauty Magazine runs a competition with a promoter such that the promoter is responsible for the selection and/or the provision of prizes then Ethio Beauty Magazine shall not be responsible for or have any liability for the provision of such prizes. Ethio Beauty Magazine does not necessarily endorse, support, sanction, encourage, verify or agree with the comments, opinions or statements posted by users in Discussion Forums or elsewhere on the Sites. Any information or material placed online by users, including advice and opinions, is the view and responsibility of those users and does not necessarily represent the view of Ethio Beauty Magazine. Ethio Beauty Magazine has joined up with selected third party partners to enable you to purchase relevant products and services. Transactions carried out with specified third party partners (and not with Ethio Beauty Magazine) will be governed by the third party's standard terms and conditions which may be found on their sites before you transact. From time to time Ethio Beauty Magazine may team up with other selected third parties to offer you the opportunity to purchase goods from the site. Such purchases will be with the named third party (and not with Ethio Beauty Magazine) and will be governed by the terms and conditions notified to you at the time of purchase. Ethio Beauty Magazine cannot and do not accept any responsibility or liability for any losses you may suffer as a result of entering into any transaction with any third party. From time to time, Ethio Beauty Magazine (or selected third parties) may include competitions, promotions or other offers on these Sites. Each such offer shall be subject to its own express terms and may not be available in all jurisdictions. You agree that Ethio Beauty Magazine is not responsible, and shall have no liability to you, with respect to any information or materials posted by others, including defamatory, offensive or illicit material. You agree to indemnify Ethio Beauty Magazine and its subsidiaries, affiliates, officers, employees, advertisers, partners, agents and representatives, and to hold them harmless from any and all claims, demands, liabilities, damages, costs and expenses (including legal fees) that may arise from: (i) your submissions, Contribution(s) or provision of content; (ii) your use or misuse of the Site; (iii) your unauthorised use of material obtained through the Sites; (iv) your breach of these Terms; (v) any such acts arising through your use of the Sites; or (vi) any other violation of the rights of another person or party. Ethio Beauty Magazine reserves the right, but undertakes no duty, to review, edit, move or delete any material posted by users in the Discussion Forums or elsewhere on the Site, in its sole discretion and without notice. 15.1. YOU UNDERSTAND AND AGREE THAT YOU ARE USING THE SITES AT YOUR OWN RISK. THE SITES ARE PROVIDED "AS IS," AND TO THE EXTENT PERMITTED BY APPLICABLE LAW, ETHIO BEAUTY MAGAZINE AND ITS AFFILIATES EXPRESSLY DISCLAIM ANY AND ALL WARRANTIES, EXPRESS AND IMPLIED, INCLUDING BUT NOT LIMITED TO ANY WARRANTIES OF ACCURACY, RELIABILITY, TITLE, MERCHANTABILITY, NON-INFRINGEMENT, FITNESS FOR A PARTICULAR PURPOSE OR ANY OTHER WARRANTY, CONDITION, GUARANTEE OR REPRESENTATION, WHETHER ORAL, IN WRITING OR IN ELECTRONIC FORM, INCLUDING BUT NOT LIMITED TO THE ACCURACY OR COMPLETENESS OF ANY INFORMATION CONTAINED THEREIN OR PROVIDED BY THE SITES. 15.2. ETHIO BEAUTY MAGAZINE AND ITS AFFILIATES MAKE NO WARRANTY, IMPLIED OR EXPLICIT, THAT ANY PART OF THE SITES WILL BE UNINTERRUPTED, ERROR-FREE, VIRUS-FREE, TIMELY, SECURE, ACCURATE, RELIABLE OF ANY QUALITY, NOR THAT THE CONTENT IS SAFE IN ANY MANNER FOR DOWNLOAD. YOU UNDERSTAND AND AGREE THAT NEITHER ETHIO BEAUTY MAGAZINE NOR ITS AFFILIATES NOR ANY PARTICIPANT IN THE SITES PROVIDES PROFESSIONAL ADVICE OF ANY KIND AND THAT USE OF SUCH ADVICE OR ANY OTHER INFORMATION IS SOLELY AT YOUR OWN RISK AND WITHOUT OUR LIABILITY OF ANY KIND. 15.3. SAVE FOR THE PROVISIONS OF THE FOLLOWING CLAUSE ETHIO BEAUTY MAGAZINE AND ITS AFFILIATES SHALL NOT BE LIABLE TO YOU OR ANY THIRD PARTIES FOR ANY DIRECT, INDIRECT, SPECIAL, CONSEQUENTIAL OR PUNITIVE DAMAGES ALLEGEDLY SUSTAINED ARISING OUT OF YOUR ACCESS TO OR INABILITY TO ACCESS THE SITES, INCLUDING FOR VIRUSES ALLEGED TO HAVE BEEN OBTAINED FROM THE SITES, YOUR USE OF OR RELIANCE ON THE SITES OR ANY OF THE INFORMATION OR MATERIALS AVAILABLE ON THE SITES, REGARDLESS OF THE TYPE OF CLAIM OR THE NATURE OF THE CAUSE OF ACTION, EVEN IF ADVISED OF THE POSSIBILITY OF SUCH DAMAGES. 15.4. ETHIO BEAUTY MAGAZINE'S LIABILITY WILL NOT BE LIMITED IN THE CASE OF DEATH OR PERSONAL INJURY DIRECTLY CAUSED BY ETHIO BEAUTY MAGAZINE'S NEGLIGENCE. ETHIO BEAUTY MAGAZINE HAS THE RIGHT TO TERMINATE YOUR ABILITY TO ACCESS THE SITES, FOR ANY REASON, WITHOUT NOTICE. 17.3. Data Protection: Ethio Beauty Magazine and our sponsors and promoters may use your details to let you know about other products and services which we think would be of interest to you. Occasionally, we may also pass your details to selected companies. This will only be done with your permission so we advise you to check the tick boxes on the relevant form carefully. Ethio Beauty Magazine is registered as a data controller under the Data Protection Act 1998. While Ethio Beauty Magazine takes every care to ensure that the information on these Sites is accurate and complete, some of it is supplied to Ethio Beauty Magazine by third parties and Ethio Beauty Magazine is unable to check its accuracy or completeness. You are advised to verify the accuracy of any information before relying on it. Further, due to the inherent nature of the Internet, errors interruptions and delays may occur in the service at any time. Accordingly, Ethio Beauty Magazine’ Sites are provided "as is" without any warranties of any kind and Ethio Beauty Magazine does not accept any liability arising from any inaccuracy or omission in the information or interruption in availability. 20.2. Ethio Beauty Magazine expressly reserves the right to request that any link in breach of these Terms be removed and to take whatever other action it deems appropriate. 20.3. On these Sites you may be offered automatic links to other sites. Whilst Ethio Beauty Magazine hopes you will be interested in those other sites, you acknowledge that their owners may be independent from Ethio Beauty Magazine and Ethio Beauty Magazine does not endorse or accept any responsibility for their content. 20.4. Pages of the Site may contain some contextual affiliate marketing links created by third parties. Purchases made on these third party sites are the sole responsibility of that site. Purchases made through these links may result in a commission being earned by Ethio Beauty Magazine. 21.5. Unless otherwise specified on the Sites, the content of the Sites is directed solely at those who access the Sites from the United Kingdom. Ethio Beauty Magazine makes no representation that any of the content of the Sites is appropriate for use elsewhere, or available in any other locations. Those who choose to access the Sites from any other location are solely responsible for compliance with local laws and regulations if and to the extent that they are applicable. 21.7. For the exclusive benefit of Ethio Beauty Magazine, Ethio Beauty Magazine shall retain the right to bring proceedings as to the substance of the matter in the courts of the country of your residence.